(note: although all the statements in this article are based on reliable sources listed in the references at the bottom, it is stripped of all citations to make the reading easy). - Operation D鈔 Thắng 21 (20 to 26 October 1965), the first Pleime preparatory phase, was the relief operation of the besieged Pleime camp. - Operation Long Reach, which was the Chu Pong phase, comprising two operations: Operation All the Way (27 October�November 1965) conducted by the 1st Air Cavalry Brigade and Operation Silver Bayonet I (9� November 1965) conducted by the 3rd Air Cavalry Brigade. - Operation Th�̀n Phong 7 (18-26 November 1965) conducted by the ARVN Airborne Brigade in conjunction with the 2nd Air Cavalry Brigade conducting Operation Silver Bayonet II in the Ia Drang area. It was the final Ia Drang exploitation phase. the process of which is based on a close cooperation between the two allied forces and characterized by a special procedure of "common operational concept, common intelligence, common reserve, and separate command"
In July 1965, General Chu Huy Man was assigned commander of B3 Field Front in preparation for the Winter-Spring 1965 Campaign to conquer the Central Highlands. The B3 Field Front Command employed three regiments in the effort to conquer the Central Highlands: the 32nd to set up the ambush to destroy the ARVN relief column; the 33rd to put a siege of the Pleime camps; and the 66th to join force with the 32nd and 33rd to overrun Pleiku city. The North Vietnamese Communist Government got help from the Chinese Communist Government in terms of military, financial aid, and Chinese advisors. A Chinese Advisors Group established its headquarters in Phnom Penh to coordinate the logistics aspect of the NVA Pleime attack. In the exercise of the Campaign, II Corps Command had a unique source of intelligence, consisted of radio intercepts of the communications between the Chinese Advisors that II Corps Command alluded to as "special agents". It allowed the planning for every aspect of the operations on "current(real-time) intelligence". It also permitted the accurate scheduling of the B-52 strikes. It was generated at J2/MACV level (Brigadier General McChristian)and disseminated to G2/ACDF (Brigadier General Knowles) through the channel of G2/IFFV (Major General Larsen). In September 1965, prior to attack of the Pleime camp, a B-52 strike - to destroy the NVA B3 Field Front Forces comprising the three 32nd, 33rd and 66th Regiments as they assembled in the bases set up in the Chu Pong areas to stage the attack of the Pleime camp scheduled for December 1962 was in the planning on the desk of J2/MACV. When the B3 Field Command decided for an earlier attack on 19 October with only the 32nd and the 33rd, the plan was modified with the introduction of Operation D鈔 Thắng 21 (Pleime) and Operation Long Reach (Chupong) with the purpose to allowing the three 32nd, 33rd and 66th to regroup as available targets for B-52 bombers. The plan was code-named "Plei Me/Chupong Campaign" and narrated in Brigadier General McChristian's report, "Intelligence Aspect of Plei Me/chu Pong Campaign". A target becomes available for B-52 strike when it can be pinpointed in a one square kilometer spot. 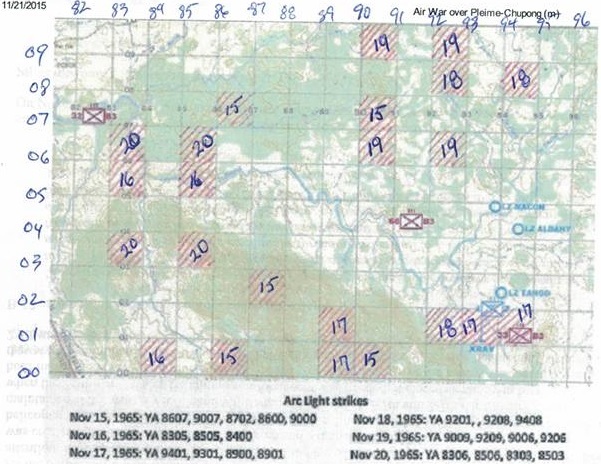 On November 11, intelligence source notified Brigadier Knowles all three NVA regiments had assembled within one square kilometer area with the 66th being the last one reaching that condition (center of mass Vic YA 9104), and the 32nd (YA 820070) and the 33rd (YA 940010) less than one square kilometer. It was on that day that Brigadier General Knowles presented the original B-52 strike plan of J2/MACV through Major General Larsen to Brigadier General DePuy in order for the chief J3/MACV to execute the B-52 strike. A particularity of the B-52 strike operation at Chu Pong, is that the reaction strike time was reduced down to 14 hours and 17 minutes from the normal required 48 hours. DePuy "stated that this is the fastest a strike of this nature ". Upon its arrival in Viet Nam in September 1965, the 1st Air Cavalry Division was put under the command of I Field Force Viet Nam (IFFV) and to operate in the II Corps areas of responsibility. The 1st Air Cavalry immediately established its headquarters named Camp Halloway in An Khe, Central Highlands, while its newly arrived troops started to conduct operations in the Bong Son coastal area of Qui Nhon. The Air Cavalry participated in the Campaign in two steps: Operation Ingram (from 23 to 26 October) then Operation Long Reach (from 27 October to 26 November). Operation Long Reach derives from trường chinh (in Vietnamese). It was assigned - on 26 October - by the II Corps Command to the 1st Air Cavalry Division with the mission to pursue the enemy into the Ia Drang-Chu Pong complex. The ARVN Airborne Brigade was put on the standby as reserve force during the Chu Pong phase, until it became the main force during the Ia Drang phase. The U.S. Air Force had a decisive role in repulsing the attacking troops at the camp and the ambush sites. - On 19 October, the NVA 33rd Regiment launched the attack of the Pleime camp. The attack was a luring tactic aiming to attract the II Corps main force out of Pleiku to destroy it with an ambush. II Corps Command took up the challenge. - On 20 October, it immediately reacted by establishing a relief Armored Task Force to rescue the camp and at the same time dispatched a two ARVN-US Special Forces company team to reinforce the camp. - On 22 October the ARVN-US Special Forces team entered the camp after being helilifted to a location North East Pleime. Meanwhile, to counter the NVA mobile ambush tactic, the Relief Armored Task Force was ordered to linger around Phu My as to give the appearance of conducting a patrol operation while waiting for more reinforcement. - On 23 October, II Corps Command made a request for reinforcement from IFFV (General Stanley R.Larsen) to replace the 22nd Ranger Battalion that was needed to reinforce the relief column in the task of securing the Pleiku Airfield and Pleiku city. At 1300 hours the US reinforcement (Ingram Task Force comprising 1/12 Air Cavalry Infantry Battalion and the one battery 2/19 Arty) arrived in Pleiku. - On 24 October, the Relief Armored Task Force received order to push toward the camp, and the 2/19 Air Cavalry Arty battery moved from Pleiku Airfield to position at 10 km South of Phu My to provide artillery support to the relief column. After failing to achieve the ambush, the 32nd Regiment received the order to retreat. - On 25 October, the Relief Armored Task Force pushed through the ambush site and entered the camp at dusk. - On 26 October, Operation D鈔 Thắng 21 ended with the retreat of the 33rd Regiment. - On 26 October, while the relief of the Pleime camp was wrapping up, II Corps Command requested I Field Force Vietnam (IFFV) Command to have the 1st Air Cavalry Division to pursue the withdrawing troops belonging to the two attacking 32nd and 33rd Regiments. It was approved and the operation was named Operation Long Reach (trường chinh in Vietnamese). To entice the B3 Field Front to wanting to attack the Pleime camp again with its three 32nd, 33rd and 66th Regiments together this time, while expanding the Tactical Operational Area of Responsibility of the Air Cavalry, the Pleime Camp was maintained under the responsibility of II Corps. - To enhance the ability to work closely with the ARVN in the execution of Operation Long Reach, Brigadier General Knowles set up his tactical Command Post, co-located with II Corps Headquarters in Pleiku. - On 27 October, the 1st Air Cavalry Brigade commenced Operation All the Way as the first part of Operation Long Reach while the lead elements of the 33rd had closed on it assembly area at the village Kro. - On 28 October, the 32nd Regiment had nearly reached its base on the north bank of Ia Drang. - On 29 October, the 33rd Regiment closed on it base at Anta Village. - On 1 November, units of the 1st Air Cavalry Brigade had the first engagement with battalion size enemy force at the 33rd Regiment aid station. - On 2 November, the 32nd Regiment Command Post had arrived at Hill 762, but the remaining of the regiment troops still stretched back to near Pleime, and the 66th Regiment was moving into assembly areas in the Chu Pong-Ia Drang area. - On 3 November, units of the 1st Air Cavalry Brigade ambushed the 8/66 Battalion. - On 4 November, the 33rd Regiment moved out of its base at Hill 732 onto the eastern slopes of Chu Pong with its battalions taking up positions from Hill 732 down through Anta Village to the north bank of the Ia Meur. - On 6 November the 6/33 Battalion was almost annihilated after an engagement with the 2/8 Air Cavalry Battalion. - On 9 November, the 33rd Regiment gathered the last of its units. - On 10 November, the 3rd Air Cavalry Brigade replaced the 1st Air Cavalry Brigade and the operations were shifted from west to east in a diversionary maneuver to entice the B3 Field Front to regroup its three regiments in assembly area to regain its early advantage with a second attack of the Pleime camp. It set the D-day for 16 November. - On 11 November, the 66th Regiment was along the north bank of the Ia Drang (center of mass Vic YA 9104); the 32nd Regiment was also up north (YA 820070); and the 33rd Regiment was in the vicinity of the Anta Village (YA 940010). All three regiments became available targets for B-52 strike. Brigadier General Knowles notified Brigadier General DePuy to initiate the execution of the B-52 strike. - On 12 November, B3 Field Front units continued preparations and rehearsals for the scheduled attack on Pleime. Major General Larsen, IFFV Commander issued order to General Knowles to revert the operations to the west in preparation to perform a diversionary maneuver to keep the three B3 Field Front regiments at their assembly areas. - On 13 November, some recon parties and transportation units had moved out heading toward Pleime. Colonel Brown, 3rd Air Cavalry Brigade Commander, issue order to Lieutenant Colonel Hal Moore, 1/7 Air Cavalry Battalion to prepare for an air assault into LZ X-Ray the next day. - On 14 November, 1/7 Air Cavalry was inserted at LZ X-Ray, followed by the 2/7 Air Cavalry Battalion. The B3 Field Front reacted by postponing the scheduled movement to attack the Pleime camp and threw in the battlefield to engage the Air Cavalry troops with the 7/66 and 9/66 Battalions. In the afternoon, Colonel Brown moved the 2/5 Air Cavalry Battalion to LZ Victor in preparation for the withdrawal of the 1/7 Air Cavalry Battalion. -On 15 November, at 09:30, Colonel Brown landed down at LZ X-Ray to make preparation to withdraw the 1/7 Air Cavalry Battalion, deeming its job of drawing the attention of the enemy away from attacking the Pleime camp done. By 1500 hours, the 2/5 Air Cavalry Battalion closed in the LZ X-Ray after a five-hour march from LZ Victor in preparation to allow the 1/7 Air Cavalry Battalion to withdraw the next day. - On the same day, at precisely 16:00, B-52's first wave of carpet bombings fell about 7 kilometers west of LZ X-Ray and continued with four more sorties that day. At 16:30, Brigadier General Knowles, 1st Air Cavalry Division Forward, landed down at the LZ X-Ray to announce the withdrawal of the 1/7th Air Cavalry Battalion set for the next day. - On 16 November, the 1/7 Air Cavalry Battalion was helilifted out of the LZ X-Ray, covered by the 2/7 and the 2/5 Air Cavalry Battalions. Meanwhile, B-52 bombers performed more sorties and struck various enemy troop position all over the Chu Pong-Ia Drang complex. - On 17 November, the 2/7 and 2/5 Air Cavalry Battalions were ordered to march out the landing zone heading north bound toward LZ Albany and north-northeast bound toward LZ Columbus to make way for the B-52 bombers to strike the enemy troops remaining in LZ X-Ray areas and various other locations of the Chu Pong- Ia Drang complex. Upon approaching the LZ Albany vicinity, the 2/7 Air Cavalry walked into a "meeting engagement" with units of the 1/33 and 8/66 Battalions. The Air Cavalry troops sustained heavy lost in this engagement. During the day, B-52 bombers continued carpet bombing the Chu Pong -Ia Drang complex.complex. - On 17 November, after two days of B-52 strike, II Corps Command based on estimated the enemy force had lost 2/3 of its strength, decided to "finish off" the Campaign with Operation Thần Phong 7 conducted by the ARVN Airborne Brigade. A new firepower base was established at LZ Crooks to give artillery support to the Airborne Brigade. It was secured by the 2/5 Air Cavalry Battalion conducting Operation Silver Bayonet II. - On 18 November, the Airborne Brigade set up its forward command post at the Duc Co camp alongside the five Airborne Battalions. During the day, B-52 bombers continued carpet bombing the Chu Pong -Ia Drang complex. complex. -On 19 November, B-52 bombers continued carpet bombing the Chu Pong -Ia Drang complex. - On 20 November, the 3rd and 6th Airborne Battalions was inserted at a location north side location of the Ia Drang where they was able to ambush the 634th Battalion belonging to the 32nd Regiment that had been avoiding contact during the previous phase. During the day, B-52 bombers continued carpet bombing the Chu Pong -Ia Drang complex. - On 22 November, the entire Airborne Brigade crossed to the south bank side of the Ia Drang to set up an ambush along the only corridor that could be used to withdraw to the Cambodian border. - On 24 November, the 334th Battalion belonging to the 32nd Regiments was ambushed. - On 26 November, witnessing no further contact, the ARVN Airborne Brigade withdrew from the area. - Phase I: 220 KIA(BC), 228 KIA(est), 115 WIA, 6 CIA, 24 weapons(crew served), 81 weapons(individual). - Phase II: 1515 KIA(BC), 2042 KIA(est), 1178 WIA, 163 CIA, 126 weapons(crew served), 897 weapons(individual). - Phase III: 265 KIA(BC), n/a KIA(est), n/a WIA, 10 CIA, 19 weapons(crew served), 49 weapons(individual). - Total: 4,254 KIA(BC), 2,270 KIA(est), 1293 WIA, 179 CIA, 169 weapons(crew served), 1,027 weapons(individual). NVA casualty figures advanced by II Corps Command were relied especially on NVA regimental command posts' own loss reports, intercepted by ARVN radio listening stations. Furthermore, they include NVA troop casualties caused by the 5 day Arc Light airstrike that the NVA and US sides fail to take into account. Note: Each of the three NVA regiments had a total of 2,200 soldiers comprising: 1st Bn 500, 2nd Bn 500, 3rd Bn 500, Mortar Co 150, Anti-Aircraft Co 150, Signal Co 120, Transportation Co 150, Medical Co 40, Engineer Co 60, Recon Co 50. - CHECO (24 February 1966), The Siege of Pleime, HQ PACAF: Tactical Evaluation Center. - CHECO (26 February 1966), Silver Bayonet, HQ PACAF: Tactical Evaluation Center. - CHECO (15 September 1967), Arc Light 1965-1966, HQ PACAF: Tactical Evaluation Center. - Coleman, J.D. (1988), Pleiku, The Dawn of Helicopter Warfare in Vietnam.,New York: St.Martin's Press. - G3 Journal/I Field Force Vietnam, November 14�, 1965. - Kinnard, William (1966), Pleime Campaign, After Action Report. -McChristian, J.A. (1966). Intelligence Aspect of Pleime/Chupong Campaign, J2/MACV. - Nguyễn Nam Khanh (23 November 2005), "Pleime-Ia Drang Victory" . - Moore, Harold G.; Galloway, Joseph L. (1992), We Were Soldiers Once ... and Young � Ia Drang: the battle that changed the war in Vietnam. New York, New York: Harper Perennial. ISBN 0-06-097576-8. - Nguyễn Hữu An (2005), Chiến Trường Mới, Hồi Ức, H� Nội: Nh� Xuất bản Qu鈔 đội Nh鈔 d鈔. -Vinh Loc (1966, Why Pleime, Viet Nam: Information Printing Office. - Vĩnh Lộc (1966). Pleime, Trận Chiến Lịch Sử, Viet Nam: Bộ Th鬾g Tin.